Perhaps the most famous Jamaican athlete in the Olympics has a lot of titles: sprinter, Olympian, gold medalist, and world record-holder are among those, and he's only 29 years old. On Aug. 13, the sprinter's mother, Jennifer Bolt, answered a question that was probably on many people's minds: is Usain Bolt married? It turns out the athlete isn't married, and his mother hopes that will change soon. But when it comes down to it, there shouldn't be any pressure on him or on any other athletes — especially women. "I would hope he'll settle down, get married and start his family," Jennifer told CNN's Don Ridell two nights before her son competed in the 100-meter race. "I know he'll settle down because he has said it. He told me many times he's going to start his family." I don't want to rain on anyone's parade here — Jennifer hopes her son gets married, and that's alright. But it's also alright if Bolt doesn't get married anytime soon, or if he doesn't marry at all. Like the matriarch of the Bolt family said, Bolt has channeled his energy into training and becoming the best at his sport for the majority of his life — it's no surprise he hasn't found time to date, and even less of a surprise that he hasn't settled down yet. In his mind, he still has some gold medals to win on the track. And then there's the fact that Bolt's fame means not everyone will be interested in him for the right reasons. In an April 2016 interview with The Telegraph, Bolt expressed his current views on dating. "You get famous, there's so much pressure of girls wanting you," Bolt said. He used Wayne Rooney, a British soccer player who got married young, as an example. "You get married at 21, you have not lived one bit." Bolt said. While he made it clear that he wasn't knocking those who choose to marry young, Bolt was clearly opposed to the pressure placed on athletes to settle down and get married. 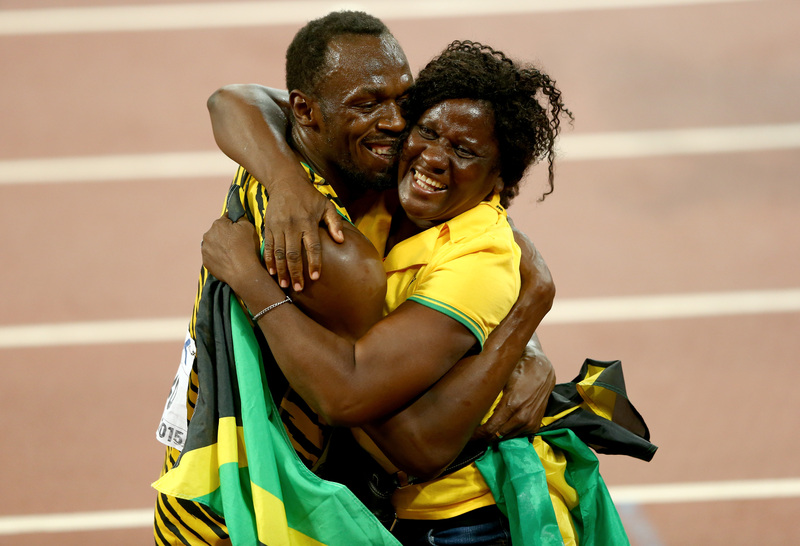 His mother shouldn't worry, though — Bolt admitted he does want to get married eventually. "I've thought about it, but I know I'm not going to get married before 35, for sure," he said. While Bolt is in no rush to get married, it's great that he's shed some light on the pressures young people face — from their parents, from society, and, if you're "the fastest man in the world," from the media — to tie the knot. This pressure is far greater for women, even those who are competing in the Olympics alongside him. On Sunday, Aug. 7, U.S. shooter Corey Cogdell-Unrein won the bronze medal for women's trap shooting. Instead of describing her as a shooter or an athlete, the Chicago Tribune called her "wife of Bears lineman Mitch Unrein." Although the Chicago Bears are a popular team, the Tribune reduced Cogdell-Unrein to little more than her marital status. The previous night, Hungarian swimmer Katinka Hosszu beat the world record for the 400-meter individual medley, and an announcer credited her husband/coach as "the guy responsible for turning ... his wife, into a whole different swimmer." As Bolt has shown us, this focus on marriage does not only apply to women, even though women are more likely to be on the receiving end of it. As for his future? Bolt also revealed that he does have a girlfriend of two years — "but I'm not going to tell you who she is," he said to The Telegraph's Mick Brown. "I want to keep it small for now, because I know when it gets out there's going to be a lot of things to say ... Because I've been through the media. I understand how you guys are." Maybe they'll get married eventually, and maybe they won't. All that matters is that Bolt and his girlfriend do what makes them happy.